Yet another reason I like geocaching was the find of this park. We visited the "Robert H. Long Nature Park" in West Bloomfield/Walled Lake while hunting for the M-5 Marshview (GCMRBT) cache. We didn't find the cache, but this park was a great find. Fortunately I had left the D200 in the car (though only with the 24-85mm) and managed to fill the 4GB card. 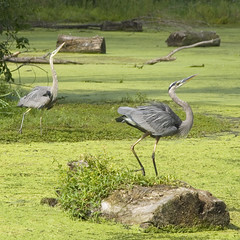 A pair of Blue Herons seem to have gotten themselves into a little bit of a territorial dispute. They put on a great show. I was so happy to have a camera with me though.